And rightfully so. No one wants to wear glasses that constantly slide off, or worse, where the lenses are not positioned properly. Video: learn more about the importance of lens placement. Let us introduce PerfectFit™ to you. This one-of-a-kind process is based on two different pictures that are uploaded by you, the customer. You only need about 5 minutes to take these 2 pictures, and once they are uploaded, our lab technicians will utilize them to take important measurements that will make sure that your glasses are pre-adjusted to fit your face. You'll only need to take these pictures once as an adult. And, more importantly, these same exact pictures will allow us to get the correct vertical placement of your lenses (referred to as "vertical fitting height" or "seg height"). PD alone cannot guarantee a perfect fit for your glasses. Vertical placement is just as crucial. Don't blame the other websites for not telling you; they have no solution for calculating the vertical fitting height, so they work with a mathematical formula based on the "average" fitting height. But let's be realistic, prescription glasses should never be based on averages. How satisfied would you be if your eye doctor gave you a prescription based on "averages"? 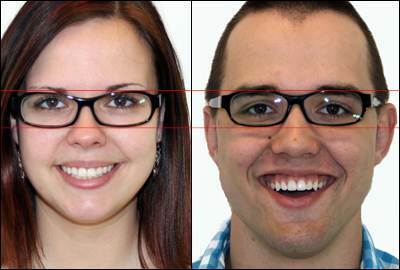 Vertical lens placement example: Here are two people wearing an identical pair of glasses. Take note of how their pupils sit in the frame at completely different heights. After checking out, you'll be given the choice whether you want to upload your pictures. You can choose to upload these into your account, where they will be saved for future use. For future orders, you will only need to complete the wizard to link your profile to the frames you just purchased, without the hassle of uploading the photos all over again. You can also upload the pictures as a guest (but the next time you order you will have to upload these pictures again). 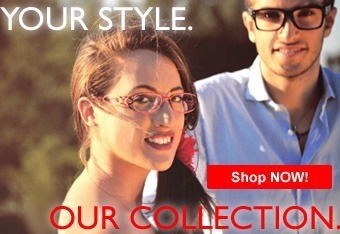 We believe that everyone should have affordable glasses, without having to sacrifice a great fit. We're proud to offer you a unique tool so you can rest assured that your glasses will be fitted with data based on your individual measurements, just like an optician would.